"This bread is great lightly toasted for breakfast or anytime!" In a large mixing bowl combine flour, baking powder, baking soda, salt, and cinnamon. Make a well in the center of the bowl. In a separate bowl combine the oil, eggs, sugar, grated pears, pecans, and vanilla. Blend well. Add to well of dry ingredients. Stir until just moistened. Spoon batter into 2 greased and floured 8x5x3 inch loaf pans. Bake in a preheated 325 degree F (165 degrees C) oven for one hour and 15 minutes. Cool on wire rack before removing from the loaf pans. This has a very subtle taste to be sure, but it is moist and sweet. I used canned pears which was time saver! Not what I was expecting...a very good bread but very similar to zucchini bread, thought it would have more of a pear taste. 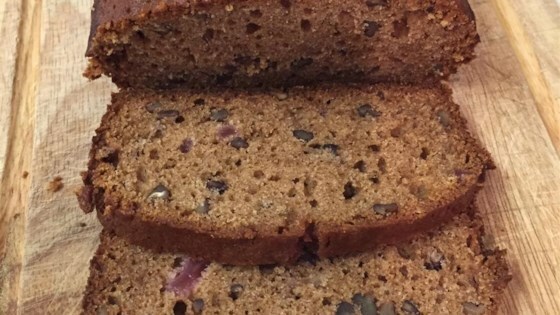 Great fruit bread! Minced some ripe pears and had a tasty treat. No other adjustments were necessary. That bread was GONE. This bread was delicious...almost sweet enough to be a dessert! A hot, buttered slice is a wonderful way to start your day. You will certainly enjoy this moist, flavorful loaf! Very tasty and easy, but I didn't get much pear taste out of it--the end result was a little like carrot cake. Next time I think I'll increase the amount of fruit I put in.